Rumor has it the Leopard originated as a secret project in the Minmatar Republic. In their endless battle against enslavement by the Amarr Empire, the Minmatar have had to develop ways not only to liberate large masses of their people, but also to sneak in and capture individuals of high strategic importance. These kinds of black ops search-and-rescue missions might be executed for key people who were held by the enemy and possessed either special qualities the resistance needed, or information the Republic couldn't afford having tortured out of them. It's notable that these individuals might not all have been Minmatar, and that the resistance movement is unlikely to have restrained itself from using the same methods on key Amarr people they'd captured with the help of the Leopard. 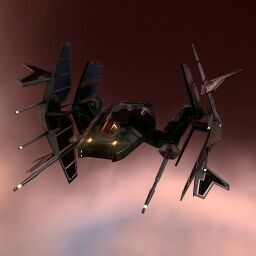 It is an extremely fast ship, meant for quick and stealthy getaways, and while its origins are covered in rumors, chances are the Minmatar leaked it to the capsuleers in order to curry favor with them. Further information about additional or recommended skills to pilot Leopard for a specific or it's common role(s) can be written here. No sub-article about Leopard roles or piloting tactics. You can write them here. Given its ludicrous speed the Leopard makes it tempting to move small goods such as PLEX, skillbooks, and fashion items very quickly. If you are tempted to attempt to move valuable items in your Leopard keep in mind that you will be a primary target for hi-sec pirates both for your cargo and for your expensive and unique shuttle. Under no circumstances use autopilot when flying the Leopard, as sooner or later you will lose it to a griefer (whether or not you have expensive cargo). This page was last modified on 10 July 2018, at 21:34. This page has been accessed 60,007 times.